Venmo's popularity makes it easy to send cash to friends and family — with over 7 million users, chances are, someone you know is on Venmo. And because it's available for both iPhone and Android, this popular app lets you pay in almost exactly the same way regardless of what smartphone you have. So if you like to learn more about this simple process and instantly pay back friends for your share on last week's dinner and drinks, just keep on reading. To get started, open the Venmo app for iPhone or Android. From there, tap on the transaction button (marked with a pen and a dollar symbol) to go to the "Pay or Request" page. Next, either tap on your list of available contacts or type the recipient's name, email, or phone number in the search bar along the top of the screen. Only friends who have signed up for Venmo will appear here, so if the person you need to repay is missing from the list, tell them to grab the Venmo app on their phone and sign up. From there, just tap on the recipient's name once it appears. Now, enter the exact amount you need to send, then tap on the "What's it for" section right below the payment field to input a brief note detailing your transaction. Additionally, you have the option of letting other friends know of your payment by tapping on the avatar icon on the left side right above the "Request" button, then selecting from the list of all your available friends that appear. Before processing your payment, you'll want to decide as to who can view your transaction. To edit this, tap on "Public" on the right-hand side right above the "Pay" button. 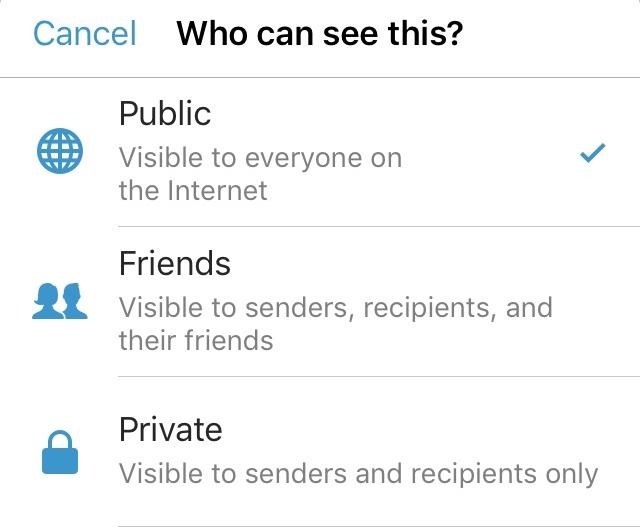 From there, simply tap on "Friends" if you only want both yours and your recipient's friends to see the transaction, or tap "Private" to keep it strictly between you and the receiver. Once everything's in order, tap on the blue "Pay" button to proceed. You'll now be taken to a confirmation page which also lets you choose your method of payment. If this is your first time sending money on Venmo and you've never attached a payment method before, you'll be prompted to do so. That's simple, though — just enter your debit card info and select "Pay with this card." If you've used Venmo before and you have more than one payment method added, tap on the Payment method tab right above the green payment button to select which account you want to charge. After selecting your funding source, tap on the green payment button to process the transaction. The recipient will instantly receive your payment, which will in turn be posted on your app's main page.